RENO, Nev. – A retired NFL tight end and a cattle contractor – both recreational team ropers – raked in $95,220 with their ropes today at the 22nd edition of the #11 Reno (Nevada) Million. Californians Sean “Bear” Pascoe of Morro Bay and Steve Simons of Sanger roped four steers in 34.21 seconds to win the event and $47,610 total per man. They needed only a 10-second run to clinch the win, but finished in 8.8 seconds. Simons and Bear’s dad Sean Pascoe had roped for years together and he and Bear, originally from Porterville, are close friends. 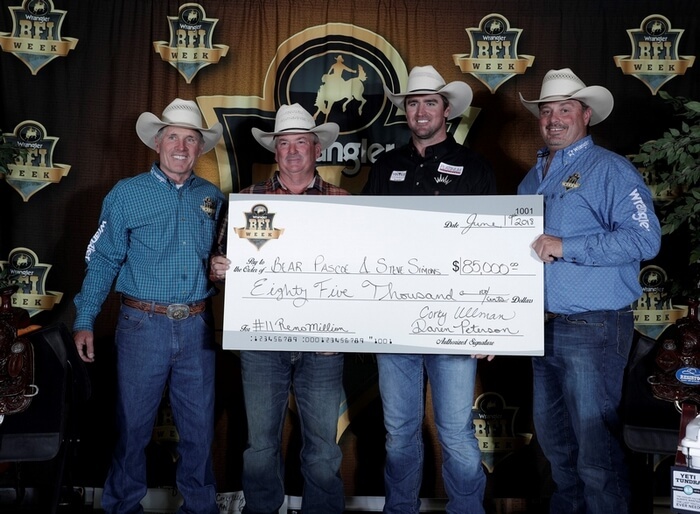 The Reno Million was founded in 1996 by local real estate developer Perry Di Loreto and is now owned by Ullman-Peterson Events as part of Wrangler BFI Week, presented by Yeti, and anchored by the Bob Feist Invitational for the pros, held yesterday. 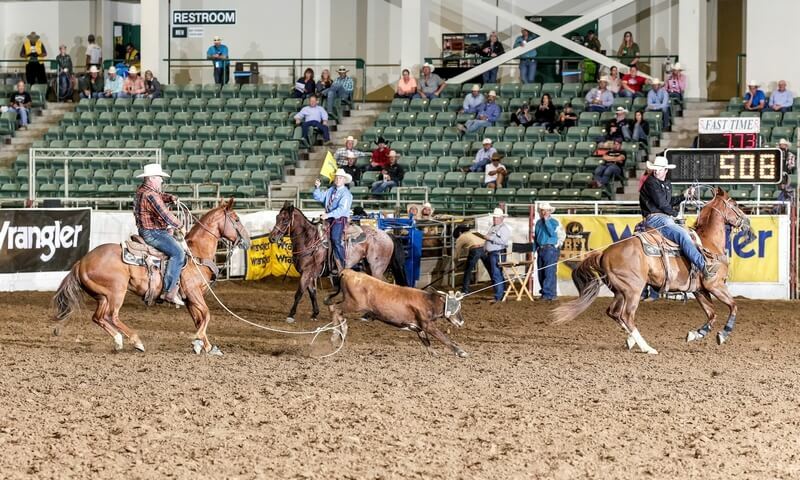 The Reno Million was designed to give equally matched amateur ropers across the country a chance at six-figure payouts, using a handicapping system similar to golf. It’s been a good week for 32-year-old Pascoe – the #6 header was also placing Tuesday in a tie for fifth in steer wrestling at the adjoining $500,000 Reno Rodeo after turfing two steers in 9.6 seconds. He expects to make Saturday night’s finals, along with his wife, Katie, who was winning the barrel racing at the professional rodeo. Pascoe, who spent five seasons playing for the New York Giants, caught four passes in their 21-17 victory over the Patriots in the 2011 Super Bowl. But he’s always been a cowboy, and continued to rope during the off-seasons. Today, he and Katie ranch on land owned by her father, Hall-of-Fame steer wrestler John W. Jones Jr. Meanwhile, the 6’5” Bear is also becoming a certified CrossFit trainer. Pascoe said continuing to work out helps him mentally as much as physically. He gives credit to his dad for imparting lots of good advice regarding the mental game over the years. In fact, Simons, a 5-Elite heeler, likens the entire Pascoe clan (Bear has twin siblings) to Louis L’Amour’s fictional Sacketts. The baby of the family, Bear has no plans to stop roping or wrestling steers. BFI Week continues through Thursday, with all events live-streamed on www.WranglerNetwork.com. Visit www.bfiweek.com for more. First Round: 1. Bear Pascoe and Steve Simons, 7.04 seconds, $6,920; 2. Kera Washburn and Dave Washburn, 7.73, $5,190; 3. Robert Perez and Joshua Reed, 7.90, $3,460; 4. Cody Every and Trevor Aldrich, 7.97, $1,730; Second Round: 1. Josh Johnson and Josh Love, 5.98 seconds, $6,920; 2. Lydia Townson and Chad Townson, 6.35, $5,190; 3. Chad Havens and T-Boy Waite, 6.52, $3,460; 4. Alan Chappell and Mark Brockmueller, 6.92, $1,730; Third Round: 1. Brent Mays and Shane Paschal, 6.56 seconds, $6,920; 2. Josh Johnson and Josh Love, 6.61, $5,190; 3. Ricky Bolin and Dustin Noblitt, 6.71, $3,460; 4. Cory Wiese and Michael White, 6.87, $1,730; Short Round: 1. Jessica Amicarella and Tony Graham, 8.02 seconds, $5,500; 2. Bear Pascoe and Steve Simons, 8.81, $3,300; 3. Kelly Cheatham and Dell Millward, 8.84, $2,200. Aggregate: 1. Bear Pascoe and Steve Simons, 34.21 seconds on four, $85,000; 2. Jessica Americella and Tony Graham, 35.73, $65,000; 3. Kelly Cheatham and Dell Millward, 42.03, $47,000; 4. Chad Havens and T-Boy Waite, 42.77, $34,000; 5. Greg Roshay and Colter Bradshaw, 45.74, $31,000; 6. Vern Serp and Skip Stansbury, 47.88, $27,000; 7. Frank Baptiste and Buster Green, 51.36, $23,000; 8. Gary Kiehne and Shawn Palmer, 52.81, $20,000; 9. Mark Harris and Jason Nearn, 60.22, $19,000; 10. Lydia Townson and Chad Townson, 27.16 on three, $18,000; 11. Darwin McGowan and Luke McClanahan, 32.99, $16,500; 12. Lucy Bishop and Al Baloo, 34.29, $14,000; 13. Bruce Chernoff and Peter Bews, 35.10, $13,000. Consolation Aggregate: 1. Josh Johnson and Josh Love, 20.17 seconds on three, $13,000; 2. Cole Lamb and Jim Bynum, 23.63, $10,000; 3. Alan Chappell and Mark Brockmueller, 23.98, $8,000; 4. Cody Every and Trevor Aldrich, 24.72, $4,000.